Der Artikel The Reagan Administration, the Cold War, and the Transition to Democracy Promotion wurde in den Warenkorb gelegt. Ihr Warenkorb enthält nun 1 Artikel im Wert von EUR 113,79. This book posits that democracy promotion played a key role in the Reagan administration's Cold War foreign policy. 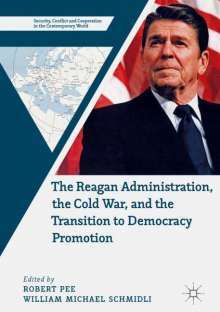 It analyzes the democracy initiatives launched under Reagan and the role of administration officials, neoconservatives and non-state actors, such as the National Endowment for Democracy (NED), in shaping a new model of democracy promotion, characterized by aid to foreign political movements and the spread of neoliberal economics. The book discusses the ideological, strategic and organizational aspects of U. S. democracy promotion in the 1980s, then analyzes case studies of democracy promotion in the Soviet bloc and in U. S.-allied dictatorships in Latin America and East Asia, and, finally, reflects on the legacy of Reagan's democracy promotion and its influence on Clinton, Bush and Obama. Based on new research and archival documents, this book shows that the development of democracy promotion under Reagan laid the foundations for US post-Cold War foreign policy.